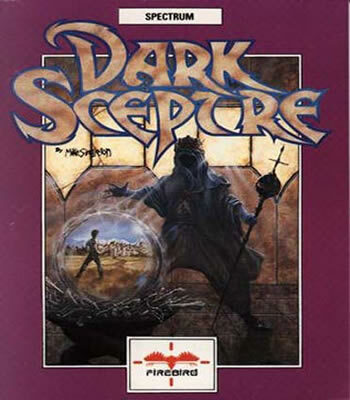 The task in Dark Sceptre is to recover the eponymous artifact. The player controls a company of warriors by assigning them specific tasks, and is hindered by six other computer-controlled factions. The main display shows a side-view of the currently watched warrior, which scrolls and tracks him as he moves through the game world. Each warrior has a rank, ranging from Thane, the team leader, to Thrall, the pawn of the game. Other ranks include Mystics, Heralds, Savages and Assassins. Play is real-time, with the player pausing to issue commands in Plan mode and then viewing results in Watch mode. Commands are selected from a menu screen and range from character-targeting actions such as KILL, AVOID, BRIBE or STALK, object related actions like SEEK, TAKE, USE, or location based actions like DEFEND or ROAM.